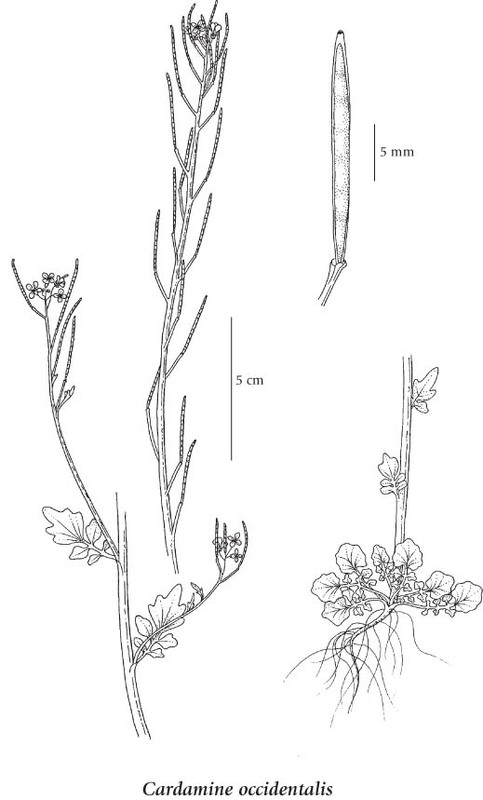 Perennial herb from a short, slender rhizome; stems 1-1.5 mm thick, enlarged and tuberous near base of leafy stems, 20-40 cm tall, simple to freely branched, erect to decumbent and rooting at nodes, glabrous to sparsely hairy. Basal leaves few, slender-stalked, pinnate, lateral lobes (2) 4-6, egg-shaped to heart-shaped, short-stalked to unstalked, 3-8 mm long, generally entire, terminal lobe 1-2 cm long, shallowly wavy-margined; stem leaves several, upper ones unstalked to nearly unstalked, fewer lateral lobes, narrowly egg-shaped to linear, mostly 1-2 cm long, entire or slightly toothed, terminal leaflet egg- to wedge-shaped, 1.5-3 cm long. Inflorescence an elongate raceme, without bracts; flower stalks ascending, 10-15 mm long; petals white, 3.5-5 mm long; sepals 1-2 (2.5) mm long. Siliques, erect, 2-3 cm long, 1-1.5 mm wide; styles about 1 mm long. Wet to moist streambanks and lakeshores in the lowland zone; infrequent in SW BC; N to AK and S to CA. Cardamine pratensis var. occidentalis S. Watson ex B.L. Rob.